In theory, you could run your Personal Injury Claim on a private fee-paying basis. You would have to pay your solicitor interim fees as the case progressed. You would have to pay for all outlays, including recovery of medical records and payment of expert witness fees. If your case went to Court, you would have to bear a hefty risk. Lose your case and you will not only have to pay the fees and outlays of your own solicitor; you will also be responsible for paying the fees and outlays of the opposing solicitor. Depending upon the complexity of the case and which Court any action is raised in, your legal bill would certainly be thousands of pounds and might be tens of thousands of pounds. Unless you have bottomless financial resources (in much the way that insurance companies do) private fee paying arrangements for personal injury claims are generally reckoned to be “a bad idea”. You need to be able to run your claim in a way which costs a lot less and carries a lot less risk for you. It is all about finding a way to insure yourself, especially against the risk that you might lose and be responsible for legal costs. A number of possibilities exist, in our experience, for providing the necessary insurance element and, in this article, we will discuss the relative strengths and weaknesses of these different options, as we see them. In some cases, you will have had the foresight to insure against the risk that you might have an accident and need to claim compensation for your injuries and other losses. In many cases, you may not even know that you had organised your affairs so well! Legal expenses insurance is a form of “Before the Event” (BTE) insurance. The “event” in this situation is your accident. You would have taken out the insurance – perhaps without even realising i t- as part of house contents or house buildings insurance (those are the usual examples, in our experience). Having discussed Before the Event insurance, we now go on to consider a separate method of funding a personal injury claim, which depends on After the Event insurance. Solicitors also refer to this method of running a case as “speculative”. On one view, you do not need to take out insurance here. Your solicitor can agree to run your claim on a no win-no fee basis. If your claim is successful, there is probably no problem with that. Coming back to the risk element, however, the problem arises where your claim is unsuccessful. If you have raised a court action by that stage, it is not enough that your own solicitor is not looking for payment for their services; in all likelihood, you will have a liability to the other party’s solicitor to pay their expenses (costs). To cover just that type of risk, enter “After the Event” insurance. As above, “the event” is the accident you have suffered and the insurance covers you for the possible opponent’s costs you will incur if your claim is unsuccessful. It also covers any outlays your solicitor has incurred in pursuing your claim (e.g. the cost of medical reports). It does not pay any fees to your solicitor – because it’s “no win-no fee”. In the absence of no-win no fee arrangements and After the Event insurance, there would be a lot of injured people who would find it very difficult to get access to justice. Where your claim is successful, you get your compensation and your solicitor will receive payment from the other side’s insurers. The solicitor’s costs are calculated on the Pre-Action Protocol Scale, if the claim has settled before the court action is raised, and by way of judicial expenses if the claim has resolved only after the raising of a court action. Eligibility for civil legal aid, in this type of situation, depends upon your income and capital. It also depends upon your family circumstances: the means of your spouse or partner will probably also require to be taken into account in this type of case. Legal aid will only be a possible option for those in lower income and capital bands. You can find out more about how eligibility works by looking at the Scottish Legal Aid Board website. A big plus in its favour – and where no win-no fee (spec) really scores – is in being the most dynamic of the three. You will want to have After the Event (ATE) insurance in place but many solicitors will have an arrangement with an ATE insurer or funding company which gives them delegated authority to proceed with cases which they deem to be “runners” (typically, cases which, to the solicitor, seem to have prospects of success greater than 50/50). With Legal Expenses Insurance (LEI), the insurer will generally want to be consulted before any significant outlays are incurred (e.g. the cost of a report from a medical expert liability expert) and that can slow things down. It is probably even worse with legal aid, in terms of speed of action. You have to apply for legal aid first of all, which can take several weeks, if you are at the stage of needing to raise a court action. You also need to get prior permission from SLAB where you want to instruct a medical expert or liability expert – or if you feel you need to get advice from an advocate (counsel). Where the projected cost of an expert report is above a certain level, SLAB will require the solicitor in many cases to get a competing quote. In some fields of expertise, there are not many experts and it can be very difficult indeed to find someone to provide a second quote for necessary work. The major downside of no-win-no fee, as we see it, is how much of any compensation you will actually receive. With legal aid, you must receive all of your compensation, as agreed with the other side or as fixed by the court. The same applies with LEI (BTE insurance) in that you will generally keep 100% of any compensation agreed or awarded in your favour. With no-win-no fee, however, in many cases there is a percentage deduction from the compensation (often 20%) in the event that the claim is successful. We have referred to this elsewhere as the “hidden” cost of some personal injury claims. All 3 methods are means of securing access to justice which might not otherwise be available to you, if you have been injured in an accident. Finding a solicitor who will deal with your claim no-win – no fee (provided the risk to you is covered by some form of ATE insurance) will probably give your claim the best chance to proceed most quickly. No-win – no fee can have a “hidden” cost. This is the amount of your damages you will lose in the event of a successful conclusion to the claim. In that respect, LEI and legal aid have benefits because you will generally receive all of any compensation which is agreed or awarded in your favour, without deduction. If you have civil legal aid, subject to a contribution (which people on the border between eligibility and non-eligibility sometimes have to pay), where your claim is unsuccessful, you will still have to pay the contribution and you will be out of pocket as a result. No-win – no fee and LEI have the advantage in that situation in that the “worst case” is that you will be no better off, not worse off, financially. The possible financial benefit to your solicitor cannot be ignored either. If it is no-win no fee and the claim fails, they will be paid nothing for their work (though they should get their outlays back under ATE insurance). If it is under LEI, they may be paid something in fees by the LEI insurer if the claim fails or they may effectively be acting no win-no fee, depending on the type of insurance. Under legal aid, the solicitor will be paid something in fees (at legal aid rates) if the claim is unsuccessful and recoup their outlays from SLAB, provided they have all been properly authorised in advance by SLAB. We hope it is helpful to have this comparison of factors of similarity and distinction affecting the most common personal injury claim funding methods: no-win – no fee; legal expenses insurance; and legal aid. It is important to be aware that no win-no fee is not “the only option out there”. In appropriate circumstances, legal expenses insurance or legal aid may be better options. The law only considers personal injury claim outcomes in terms of financial compensation and it is always a matter of finding the best way to maximise the value of your claim while keeping the associated risks as low as possible. 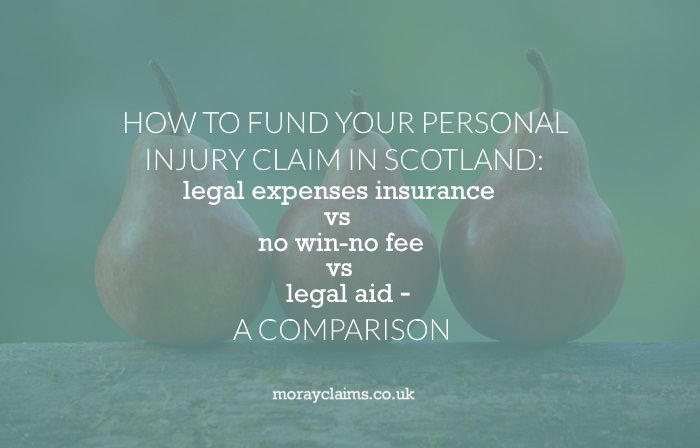 If you have any questions regarding the content of this article on comparison of personal injury claim funding methods, please get in touch with us. All initial enquiries are at no charge and without obligation. This is quite a long – and difficult – article to read and we would be keen to clarify anything which is not sufficiently explained in it. You can contact one of our team – Marie or Peter – on 01343 544077 – or you can send us a Free Online Enquiry.